Juni 2012 ist eine Studie erschienen, die sich mit der aktuellen Jugendarbeitslosigkeit und Lösungswegen befasst, die durch das LebensLernen entwickelt werden können. transformed in order to become more responsive to the needs of young people coming of age today. Rather than simple reforms, we need a new paradigm of learning. The solution consists in a new form of learning that seeks to integrate theory and practice, thinking and acting, academic and experiential learning into a holistic learning experience called LifeLearning. This way of learning is especially suitable for newly industrialized countries adding new perspectives to the debate on the high number of unemployed youth there." Thomas Stöckli received his Ph.D. at the faculty of Humanities of the Berlin Institute of Technology (Technische Universität Berlin). 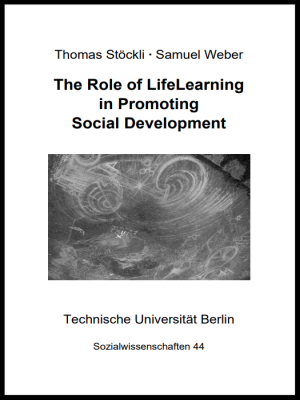 In his work he has introduced a new paradigm of learning called LifeLearning. He is the director of the Academy of Teachers Training for Waldorf Pedagogy in Switzerland, the director of the Institute for Practice-based Research as well as the co-founder of a high school which combines academic and practice-based learning. Samuel Weber is an assistant researcher and publisher at the Institute for Practice-based Research in Solothurn, Switzerland. He holds a Bachelor’s degree in History and American Studies from the University of Plymouth, United Kingdom. As of 2012, he is pursuing a Master’s degree in History and English at the University of Bern, Switzerland.